Attachments can be applied to any windows object (documents, pictures, etc.) for any applicant or customer. 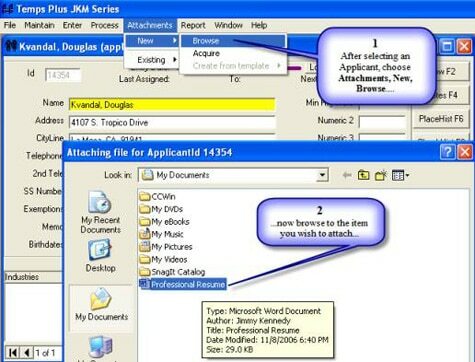 After selecting an applicant, choose “Attachments”, “New” and, then “Browse”. Once “Browse” is selected, the user can browse the items that they want to attach. You can label the attachments as you wish. If you have a scanner, you can scan directly into TempsPlus as an attachment.